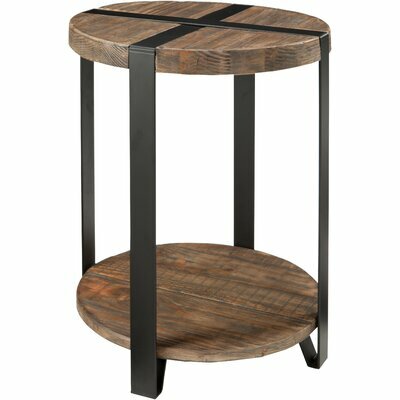 I recently bought this gorgeous wood and metal side table at TJMaxx, only to realize a few days later that I should have also purchased its twin so I could have them as bedside tables. When I went back of course the matching table was gone, it was such a good buy. The other night I was in Target and happened down the furniture aisles (because why not) and saw these wood and metal bar stools on sale. And then I thought, huh, I guess I have a certain taste in furniture. There is something really pleasing to the eye about furniture that mixes both wood and metal, at least in my opinion. It might be the ironworker in my blood. My dad built customs beds for himself, my sister and I, that are a blend of metal and wood and so I guess I come by it naturally. Below are some of my favorite pieces that combine the two, making for what I like to call a rustic chic look. And of course now every time I step inside TJMaxx I will have my eyes peeled for another matching side table. You never know what you might find. I bought a striped chair there two years ago and recently I saw a set of four matching chairs, so there's a possibility the table will reappear. Fingers crossed! I love that bed frame!! I love this look. The Ballard Designs catalog is full of things in this style. Every time it arrives to the house, I can feel my bank account draining. Wouldn't you know, after writing this post I went to TJMaxx and there were 3 barstools exactly in this style. I was like, is someone punking me?